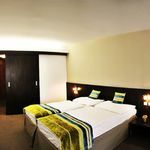 Rooms, services Medical Wellness Hotel Máj Piešťany is offering 53 nicely furnished rooms to stay in to those seeking accommodation in Piešťany. With child-friendly services being available the hotel is also suitable for children, and would be pleased to host all members of the family for your stay. The hotel gladly hosts you and your pet as well, your pet may be taken in for an extra fee. If you feel like having a meal not included in your chosen type of catering, you can always taste local dishes in the restaurant of the hotel. You may park your vehicle for free in a parking lot available on the spot. You may also enjoy refreshing wellness services at the hotel, please take a look at the information sheet for further details. At the hotel you may go online via wireless Internet connection (WiFi). An exact and detailed list of equipment in the rooms and of the services provided by Medical Wellness Hotel Máj Piešťany you will find on the information sheet below and on the information sheet of the individual rooms, including any applicable additional fees. Catering The indicated prices are without catering. You may choose another form of catering when booking your room, the hotel is also offering the following: no boarding, breakfast, half board, full board. Arrival, opening hours The earliest time to check in to your room is 14:00, the latest time to check out of your room is 10:00. The personnel can communicate with you in the following languages: English, Slovak, German and Croatian. 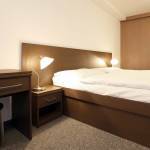 Reserve your accommodation and Medical Wellness Hotel Máj Piešťany will directly send the confirmation in 1 workday. The rating of Medical Wellness Hotel Máj Piešťany is 10 from the maximum 10, 1 based on actual and valid guest ratings and reviews.